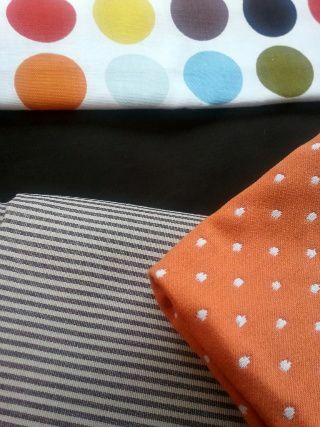 Last week I shared a photo of the fabrics I’m using in my client’s nursery. Almost immediately I got an email from another client who saw the post. She requested that I mark her file to use the same fabric in her unborn/yet-to-be-conceived baby. Funny, huh? In her email she explained how she loved how the fabrics didn’t scream baby, but would appear sophisticated like the rest of her home. I’ve heard mixed opinions about whether to decorate a baby’s room in the traditional baby colors or update them for a more mature look. This room, which I’m installing today, will have a mixture of both. There’s no shortage of baby animals in this space, but there is also a mix of fabrics [image right] that will grow with him. 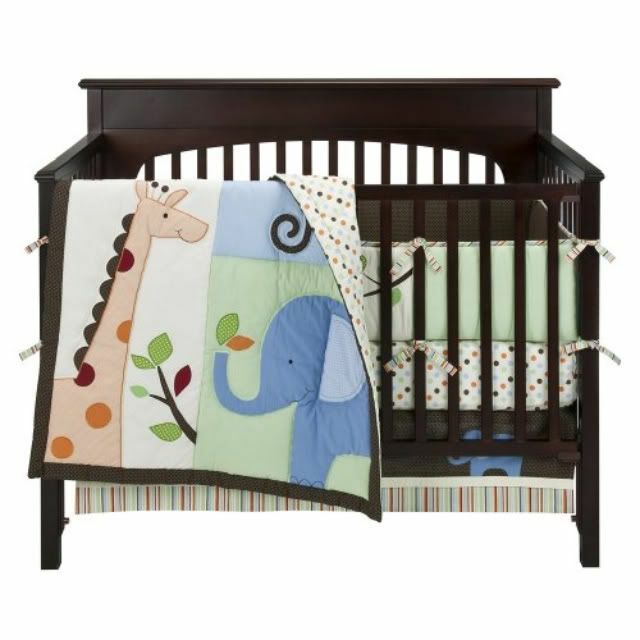 The brown and cream ticking stripe will trim the leading edge of chocolate brown drapery panels as well as the custom crib skirt. The multicolored polka dot fabric will cover a lumbar pillow for the glider. The orange dotted fabric will be an accent pillow for the crib. No worries, Mom knows to remove the pillow when the baby is in it. The jumping off point for the room was this bedding my client already purchased. The customized cribskirt as mentioned above will really help to customize the set. Note: This is not the crib we are using. I hate to keep you in suspense…really, I do. Will try to post a few snippits on twitter thoughout the day. Click here to follow me for updates! What are your thoughts on sophisticated nurseries?